The buzzard is the most common of Britain's larger birds of prey. Distribution: throughout Europe, widespread in Britain - our most common raptor. Habitat: open hilly & mountainous areas with copses & wooded valleys, secluded rocky coasts, sea cliffs, moorland, farmland and forests with large clearings. Description: broad, rounded wings, short neck & rounded tail barred brown & grey. Body plumage ranges from dark grey or brown to very pale grey. Yellow, unfeathered legs & brownish hooked beak. Size: length:- 50-55cm. Wingspan:- up to 1.5m. Food: small mammals, especially rabbits, insects and carrion. 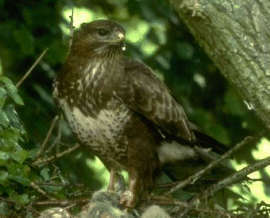 The buzzard is the most common of Britain's larger birds of prey. Its mewing 'kiew' is a familiar sound in hilly country in western or northern Britain, as it soars effortlessly, rising on a thermal of warm air.